Last year we had the privilege to meet several members of the Fairfax County Animal Shelter (FCAS) at our Language and Advocacy Internship program. Later that year, FCAS shared that they had been able to double the number of “pit bull” dog adoptions at their shelter. 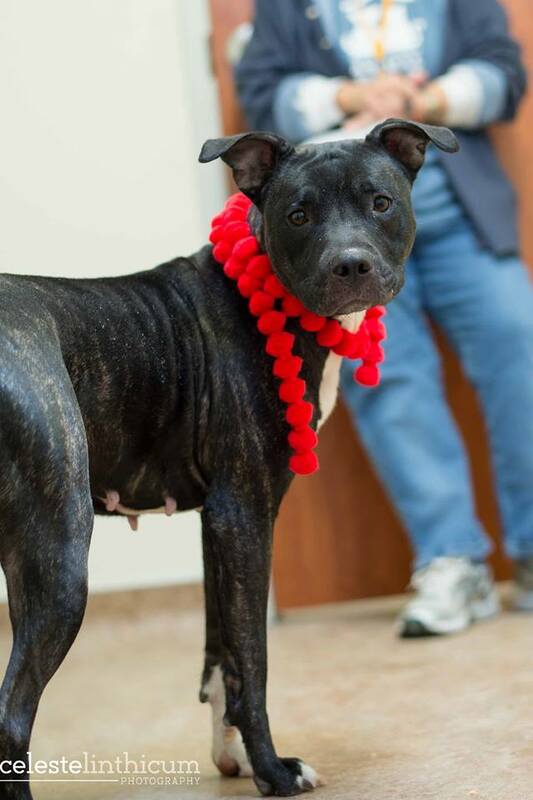 This accomplishment is noteworthy at any shelter, but FCAS managed to increase adoptions while still struggling to remove a long list of breed restrictions on their “pit bull” dogs! In January, FCAS’s efforts to remove the restrictions finally paid off. Today, FCAS is able to treat all dogs as individuals. We recently spoke with Kristen Auerbach, the Director of Communications and Outreach, at FCAS to find out more. 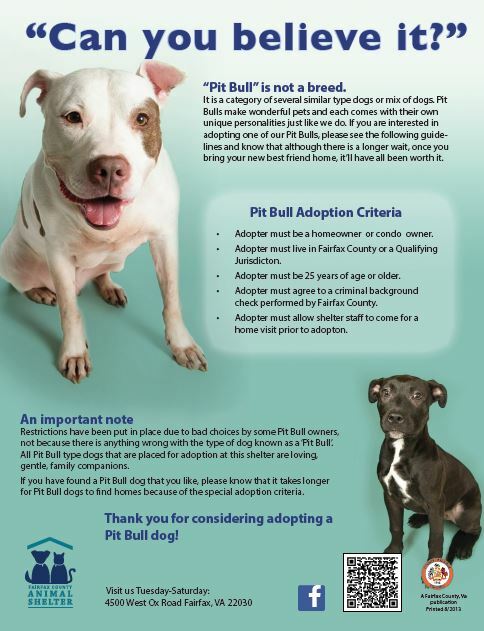 AFF: Prior to January 2014, what were the restrictions on “pit bull” dog adoptions at FCAS? -Adopter must agree to take their dog to training classes. How did the restrictions directly affect adoptions? As you can imagine, four out of five adopters walked out the door once they heard about the restrictions, even the ones that did qualify. We had to explain the policy to adopters, while simultaneously asserting that “pit bull” isn’t a breed and that pit bull type dogs were really okay. It didn’t make sense to people. Each restriction affected adoptions differently. Many adopters who were turned away because of age were really frustrated. They wanted to ‘do the right thing’ and help a homeless pit bull dog. So many young people left in tears because they were aware of the plight facing pit bull dogs and they wanted to help. The homeowner restriction was a huge problem too. Even if you rented a home and had lived there for ten years, you still couldn’t adopt a pit bull type dog, even if your landlord gave you permission. The background check and home visit: No one ever objected to these, but they prevented countless adoptions, mostly because people didn’t want to wait the days or even weeks it would take for staff members to do the background check and go to do a home visit. Fairfax is a huge county that encompasses almost 400 square miles; it can take an hour or more to get to any one place. Like most shelters, our human resources are limited and precious, and we expended a lot of them doing these home visits. 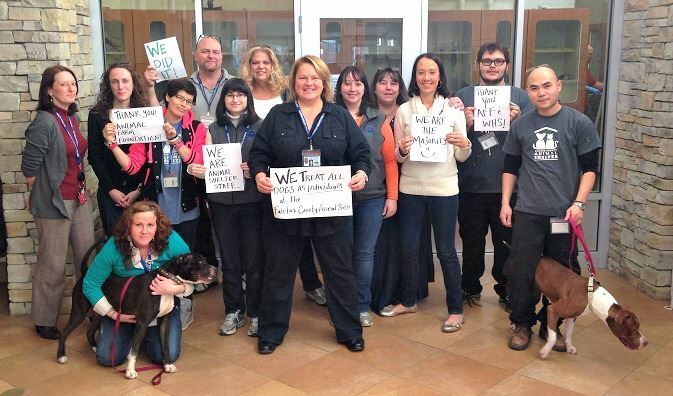 FCAS staff on the day restrictions were officially dropped at FCAS! And how did they affect adopter’s perceptions of the “pit bull”dogs? One practice that was in effect a year ago was to write “PIT BULL RULES” on every kennel card in bold, capital letters and then to highlight it with a yellow marker. Boy, that kind of thing will scare any adopter away! What about the overall affect the restrictions had on your organization? How did they impact the staff? The policy led to some shelter practices that compounded the problems, making things even worse. Just one year ago, the shelter had a practice of taking at least three ‘applications’ on every pit bull dog because the idea was that at least two would fall through. And that was often true. But not for the reasons you might think. It was because they got tired of waiting. Adopters are excited to bring home their new family member and they have so many options. In our area, adopters could choose any of the other shelters, most of which had no breed-specific policies. We adopted out so few and the staff was demoralized. There was a negative attitude about pit bull type dogs – the staff seemed to dread seeing them. It wasn’t because our staff didn’t like pit bull dogs, it was because they knew that every one that went on our adoption floor was likely to wait months to find an adopter. For our staff, compassion fatigue was heightened by this sense of hopelessness around the possibility of pit bull dogs finding homes. Finally, length of stay was a huge problem. Around 10 dogs waited five to six months or more to find homes last year. This is hard on the dogs of course, whose mental health eventually begins to decline, but it’s also devastating to the staff and volunteers who come to know and love these dogs. In order to remove the restrictions, FCAS had to work with the Fairfax County Police Department, the County Attorney, and the County Commissioners. What was that process like? What were their concerns about dropping the restrictions and how did you address them? I think that the thing we did right was to really do our groundwork. We did extensive research and attended internships, conferences and trainings to learn about best practices in animal welfare. We were really lucky, because virtually all of the other jurisdictions surrounding us: Alexandria, Arlington, Washington, Prince William, Montgomery and others had no breed-specific policies. We built a strong case, using the research and recommendations of national organizations who have spoken out against breed-specific legislation, including the AVMA, HSUS, AFF, CDC, and others. A turning point for us was when we invited the executive director and director of external communications from the Washington Humane Society to meet with our animal services advisory commission to talk about their adoption policies. Lisa LaFontaine and Scott Giacoppo were able to answer all of their questions and alleviate many of their concerns. It was following that meeting that the Commission agreed to unanimously support the lifting of the restrictions. We also invested a lot of time into one-on-one meetings with the County’s leadership, who were incredibly supportive. During those private meetings, anyone who had questions or concerns was able to express that before the moment they had to make a decision. All levels of leadership in the county, from the Chief of Police to the Board of Supervisors to the County Attorney, were supportive of the changes. Of course, there were initial concerns about public safety, but we were able to use information from Animal Farm Foundation, the National Canine Research Council, and other organizations to show that moving away from breed-specific policies would actually support and increase public safety and responsible pet ownership. Do you have any advice for other shelters that are considering dropping blanket restrictions based on breed? What some people forget is that this is a cultural shift. If you’re going to change the way that others think about pit bull type dogs, breed restrictions, or anything else, you might have to also look at the way you think about those things. Before overturning the restrictions, we started to make small changes that would help change the internal culture of the shelter as well as the experience people had when they came into the shelter. For example, “PIT BULL RULES” changed to “Ask about my special adoption procedure!” It wasn’t perfect, but it was a step in the right direction. A positive spin on “pit bull rules” and restrictions. Better, but not ideal! Instead of taking three applications on every pit bull type dog, we took one, and then committed to seeing in through in a timely manner. And then, if the adoption fell through, we made the dog available again. While we had the restrictions, we sped up the process so that instead of an adoption taking three weeks, it took three or four days. This was hard on the staff and volunteers, who had to drop what they were doing for a home visit or to run a background check, but it got the dogs adopted. And after the AFF training, we decided that we were going to invest a lot of time and energy into showing off our pit bull type dogs. We did this thoughtfully, as to not isolate or differentiate them, but we made sure that when people saw our pit bull dogs on their computers and smart phones, that they would want those pit bulls – in their home, on their couch, playing with their kids, cuddling with their cat, or riding shotgun in the car. We’ve been very conscious about how we want people to feel when they see Fairfax pit bulls. Some of the feeling we want our dogs’ images to elicit are: triumph, joy, overcoming, survival, thriving, love, family, laughter and comfort. We kept sad, hopeless, and angry off that list. 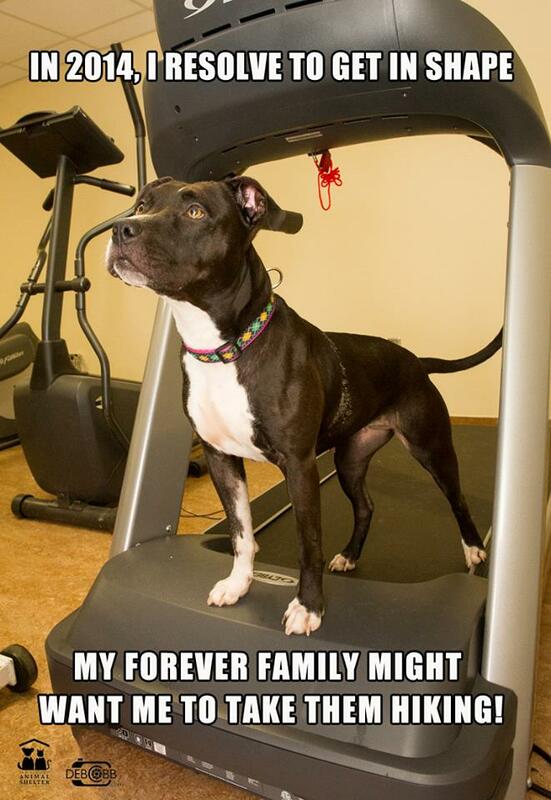 FCAS creates fun, positive memes to help connect with potential adopters through social media. What impact do you foresee this policy change will have on your organization – internally or eternally? Without the restrictions, we did 12 pit bull dog adoptions in just two weeks. Last year we only did 40 pit bull dog adoptions in the entire year! Some of our staff and volunteers were the most hesitant about the policy changed. This really surprised us. They were afraid that the dogs wouldn’t go to good homes or that they would be victims of dog fighting. They felt that we needed to have the restrictions to protect the dogs. What’s been great is that in just two weeks, those who were the most vocally opposed to the change have made a complete turnaround. They can’t believe how many of our dogs are getting adopted and to great families! Those staff resources we were using to do background checks and home visits? Now those resources are going towards a more comprehensive post adoption follow up program. We’re now going to be able to reach out to adopters, ALL adopters, several ways and we’ll be able to offer them advice and resources throughout their pet’s life. In just the past two weeks, our pit bull dog length of stay had dramatically decreased. Last year, we had nearly 10 pit bulls who spent five to six months waiting for adoptive homes. We’re hoping that nobody has to wait more than a month or so to be adopted. Thank you for sharing your experiences with us. It’s wonderful to see all of your hard work paying off for the staff and volunteers, the adopters, and the “pit bull” dogs in your care. Bravo FCAS!! Previous Can Animal Trainers and Behaviorists Be Divorced from Animal Advocacy?